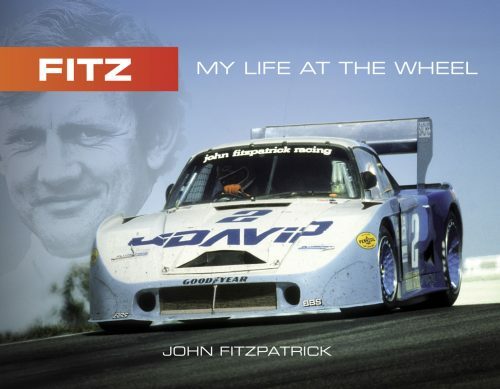 Fitz - My Life at the Wheel is now available - Autosports Marketing Associates, Ltd.
Butler, Md. (Sept. 8, 2016) – British race-car driver John Fitzpatrick’s long-anticipated autobiography, FITZ – My Life at the Wheel, was launched during the iconic Goodwood Revival Meeting in West Sussex, England on Sept. 9-11. And now it is available in the United States at www.autosportsltd.com at a price of $59.00. Published by Autosports Marketing Associates, Ltd., based in Butler, Md., and distributed in Europe by Chaters Motoring Books in the U.K., the new book was offered for signing by Fitzpatrick during the Revival and was received with great acclaim. Owned by another auto racing veteran, Michael Keyser, Autosports Marketing has published a number of popular books on the world’s prominent race-car drivers, race tracks and industry leaders. This book marks Keyser’s 13th volume of work chronicling the exciting history of motorsports, both in the U.S. and Europe. Additional information, including an excerpt from FITZ – My Life at the Wheel may be found at www.autosportsltd.com.Fitzpatrick’s racing career spanned 22 years of competition in Europe and the U.S., winning numerous championships on both continents, while driving for a variety of works teams, including Mini Cooper, Ford, BMW, Abarth, Jaguar and Porsche. FITZ – My Life at the Wheel takes the reader on a personal journey through the life of a champion, with poignant recollections of the challenges experienced and the unbridled determination and endurance that he demonstrated to succeed in a sport that sees victories scored in inches not in rhetoric. It includes 131 black-and-white and 236 color photographs, many never before published, with 13 chapters of thrilling, yet heart-warming accounts of the life of a man with a purpose – to be the best. He now happily reflects back on those days, in retirement at his home in the south of Spain with wife Sandra. “I am happy to have finished my book about my life in motorsport,” said Fitzpatrick. “I have enjoyed recalling all the highs and lows of my life and career and I am pleased to be able to share them with the readers. I thank my publisher Michael Keyser for all his hard work and patience. Attached is a digital image of the cover for FITZ – My Life at the Wheel. Autosports Marketing Associates, Ltd. is owned and operated by former IMSA driver Michael Keyser. After working at The Baltimore Sun as a reporter, Michael turned to freelance photography. In 1969, he attended SCCA drivers’ schools at the Marlboro and Bridgehampton circuits in a 911 Porsche, and in 1970 formed Toad Hall Motor Racing. For the remainder of 1970 and all of 1971 he competed in SCCA, IMSA and FIA events, at the same time hopscotching throughout the United States and Europe taking photographs for The Speed Merchants, a photo essay on road racing that was published in 1973 by Prentice Hall. In 1972 Michael finished third in the IMSA Camel GT Challenge series in a 2.5-liter Porsche, at the same time producing a documentary film, also called The Speed Merchants. Using his Porsche as a camera car, he raced at Daytona, Sebring, the Targa Florio, the Nûrburgring, Le Mans and Watkins Glen with German driver Jürgen Barth. He placed second in the Camel GT Challenge series in 1973, third in 1974 and eighth in 1975, driving a number of different Porsches. In 1976, after a victory in a Porsche at the 12 Hours of Sebring with Al Holbert, he switched to a Chevy Monza for the balance of the season, finishing fourth in the Camel GT series. In 1981, after driving for numerous teams, Keyser retired from active competition. The Speed Merchants was re-released in September of 1999 with a totally new text and twice as many photographs. A French Kiss With Death, a book about the making of Steve McQueen’s film Le Mans, by Michael Keyser, with Jonathan Williams, was released in November 1999. In 2007, Autosports Marketing published F-Stops, Pit Stops, Laughter & Tears, a two-volume set covering the colorful life of photo-journalist Bernard Cahier. The book contains many of Cahier’s most memorable photos along with personal anecdotes on the “behind the scenes” activities of some of motor racing’s great drivers from the ‘50s through the ‘80s. It was the winner of the 2007 Dean Batchelor Award For Excellence in Automotive Journalism. In 2010 the company published The Speed Merchants – Frame By Frame – The ’70s & ’80s, and in 2012 Evolution of the PORSCHE 911 In Competition – 1965-2010 and Behind Le Mans – The Film In Photographs. In 2015, Shooting Star On A Prancing Horse, written by Jonathan Williams, was published by Autosports Marketing.